Top: Pfister Hotel Lobby. Bottom Left: Nottoway Plantation. Bottom Right: El Tovar Dining Room. Every good traveler loves a great historic hotel. Our recent stay at the Pfister in Milwaukee reminded us about the Historic Hotels of America program from the National Trust for Historic Preservation. This designation was originally introduced in 1989 to promote heritage tourism and now features more than 235 properties nationwide. The honor is given to hotels that have “faithfully maintained their historic integrity, architecture and ambiance.” They must be at least 50 years old, listed on (or eligible for) the National Register of Historic Places and recognized locally as having historic significance. Searching the list is a great way to find lodging with an authentic, local flavor. Many of the historic city hotels also happen to be centrally located in downtown areas, another huge plus. Reservations can be made at historichotels.org and there is a discount for National Trust for Historic Preservation members. 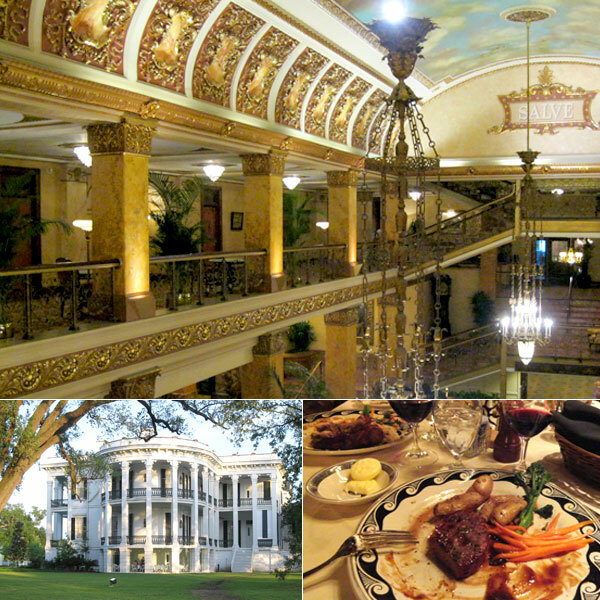 In our travels we have stayed at these Historic Hotels: Pfister Hotel – Milwaukee, Hilton Milwaukee City Center, Le Pavillon – New Orleans; Nottoway Plantation – Louisiana. All of these have been great experiences and receive high kicks of approval. Left: Bright Angel Lodge Lobby. Right: Le Pavillon Hallway. This entry was posted in Destinations, Travel Resources and tagged El Tovar, Historic Hotels, Historic Hotels of America, Le Pavillon, Nottoway Plantation, Pfister Hotel. Bookmark the permalink.